It’s a Thursday in early August. I turn up my radio, roll down the windows, and head to Leesburg, Virginia for lunch at The Wine Kitchen. It’s a real treat, as I rarely take time out of my workday for anything other than eating lunch at my desk. But I can’t pass up an opportunity to explore the restaurant’s summer menu, and meet Executive Chef Tim Rowley. The Wine Kitchen is endearingly cozy. Housed in an 1840’s brick building, a wall with painted leaves is one of many whimsical touches interspersed with the wood and brick decor. The restaurant serves as a local gathering place, where area residents can unwind with a selection of 30 wines by the glass, and a creative menu directed by the season. Chef Rowley has worked in several DC area restaurants including Vermillion, Bibiana, Tallula, and Room 11. His move to The Wine Kitchen was based on a desire to be closer to farms and wineries to give his food a hyper-local focus. My very first taste at The Wine Kitchen is a spoonful of corn soup. 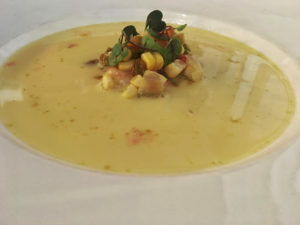 The chef describes it as “simple.” The primary ingredients are sweet corn, water, sea salt, pickled jalapeno, and lobster. Rowley adapts the soup from a recipe by famed chef Charlie Trotter. The soup is luxurious and astonishingly flavorful. It exemplifies the chef’s goal of concentrating on fresh ingredients without over-complicating his dishes. Chilled “minestrone” soup is more delicately flavored, but no less winning. 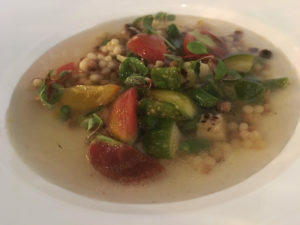 Marinated fregola is blended with roasted cherry tomatoes, summer squash, green beans, and basil. Rowley describes it as half soup/half salad. The quotation marks surrounding the word “minestrone” reflects his inability to devise a more fitting name. This one works just fine. 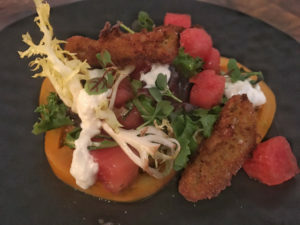 A salad with strips of fried green heirloom tomatoes and ripe watermelon is dotted with stracciatella cheese. The cheese is shipped from Liuzzi Angeloni, a certified organic cheesemaker in Hamden, Connecticut. The cheese travels farther than most ingredients at The Wine Kitchen, but the exemplary product truly elevates the salad. Roasted peach and local berry salad includes pickled plums, spiced almonds, and lemon balm vinaigrette. Ingredients at The Wine Kitchen for all dishes are carefully sourced. Case in point: the chef picks lemon balm from his backyard garden for the vinaigrette. A case of peaches is delivered daily to the restaurant from Beachwood Orchards in Pennsylvania. In addition to appetizers and salads, the lunch menu includes a selection of sandwiches and lunch plates. 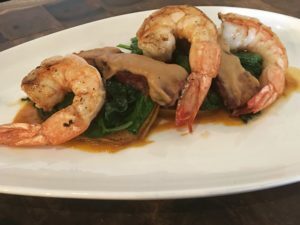 The plates currently include grilled shrimp with peach-mustard barbecue pork belly, charred tomato, wilted greens, and brioche tuiles. The dish is a play on a BLT. 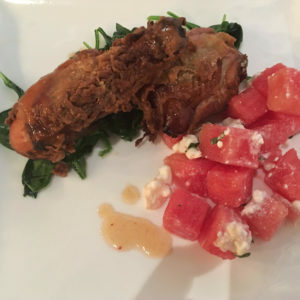 Sweet tea brined fried chicken is coated with a spiced watermelon glaze, and accompanied by watermelon-feta salad and wilted greens. As summer whizzes by, I’m keenly aware of the necessity to savor these seasonal ingredients while I can. I’m in the right place. Peaches also make their way into lavender peach cobbler. I ignore the fact that I’ve already overindulged, and dig in as if I am still hungry. The cobbler deserves my attention. 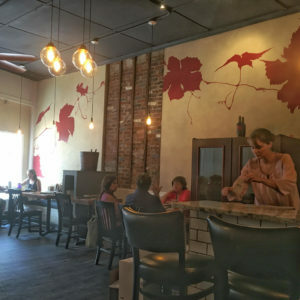 The Wine Kitchen extends its local focus all the way down to the coffee beans, which are roasted at Lone Oak Coffee Company in Winchester, Va. I leave with no regrets, except that I’ve dined at The Wine Kitchen without having a sip of wine. It is midday after all, and I must dial in to a meeting on my ride home. I don’t need an excuse to come back, but now I have one. The Wine Kitchen, with its hyper-local focus, isn’t local to me, but sometimes you just have to go the distance for a meal.